The Cantabrian coast at your fingertips. Sit in the Nautilus and enjoy the sea in its purest state and one of the most beautiful and rugged coastlines in Spain. Thanks to our boat, and the circuits that we have prepared for you, you will know firsthand the coast of the area. · The minimum age to embark is from 2 years..
· No special clothing is necessary. We will give you a small lifejacket. · It is very important to take Comfortable clothes and protection from the sun We recommend (glasses, cream, water ...). · We also recommend that do not forget your camera. · Our boarding point is at the Puerto Deportivo de Ribadesella (door located in front of the Red Cross). We ask you to please be there at least 10 minutes before the departure time. · The nautilus is a semi-rigid boat of nine meters in length with capacity for 12 passengers besides the crew. · We are one nautical tourism company with more than 25 years of experience in the sea riosellano. A company of a family nature and marine tradition that will bring you closer to unforgettable corners without you taking any risks. · Our boat complies with all regulations CEE and the crew possess all the qualifications required by the competent authorities. · We have civil liability and accident insurance, to ensure the safety and enjoyment of our customers. This is our most popular route. Part of the marina of Ribadesella, where we release moorings, and reaches the coast of Nueva de Llanes before returning. One hour of travel It gives a lot: Milla 10 of exciting and vivid images that will take you to forget. 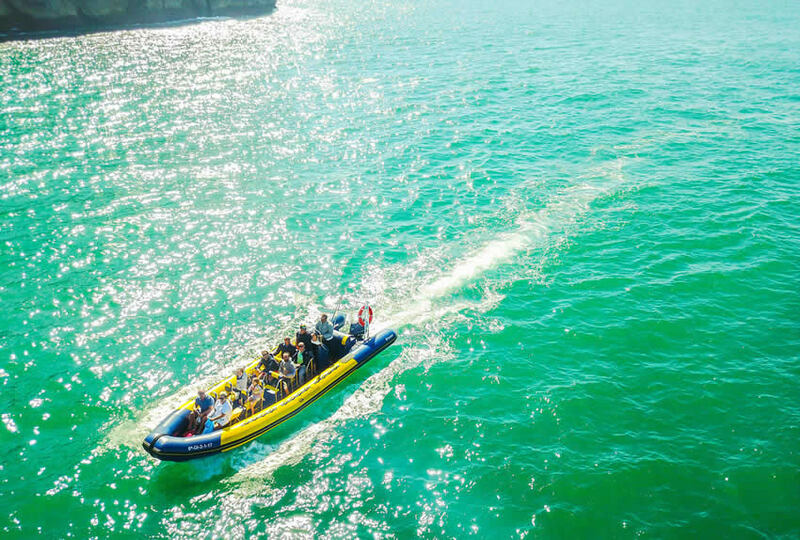 The Jurassic coast, the high cliffs, the coves that appear between them, the underwater caves at the foot of the steep coast, the sublime panoramic views of the coast and the mountain range suppose an experience unique in its kind. 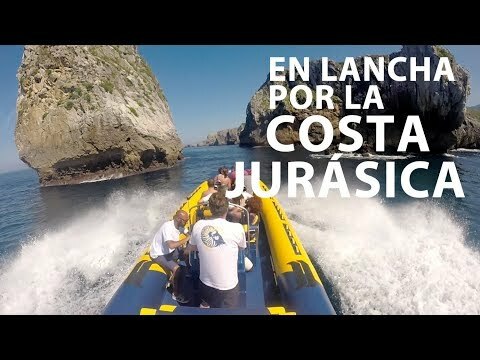 We will reach the area of ​​the famous Bufones de Pría, where we will admire a place of a striking beauty, with the nearby mountain ranges ending at the same sea. Holy Week and all the days of the 15 from June to the 30 of September. Rest of the year, only weekends and holidays, except December, January and February. Schedule: 11: 30, 13: 00, 17: 000, 18: 30 hours. 22 € children up to 12 years. 40 € people with disabilities (33% or higher). 40 € per person for groups of 6 or more. 40 € for families of 4 people or more. For these routes, the ticket can only be purchased in our offices. These routes will be made with a minimum of 6 passengers. If that number is not reached, the route will be postponed until the next day, weather permitting. Duration 1: 30 hours approx. Departure from Ribadesella 30 minutes before sunrise. We will sail east, to Nueva de Llanes, and, in front of the beach of Cuevas del Mar, we will contemplate the sunrise. Departure from Ribadesella 30 minutes before nightfall. We will sail west, until Lastres, following the sun, and, in front of this picturesque seaside town, we will enjoy a magical moment until it is hidden in the horizon. Tour of Milla 21 (40 km.) Approximately, from Ribadesella to Lastres y vuelta. We will sail to the west, passing through several beaches such as Vega beach, Arenal de Morís, La Espasa beach, Isla, la Griega, etc. Lastres is also known for many thanks to the TV series, "Dr. Mateo", in which he received the name "San Martín del Sella", and in whose streets the famous series was filmed. Duration 1: 20 hours approx. Departure time 10: 00 hours. 50 € per person (minimum 6 people). 25 € under 12 years. 46 € people with disabilities (33% or higher), groups (6 people or more) or large families (4 members or more). NEW 2019 SEASON !!! Discount 30% only until the June 15. We launch this new route thinking of all those, and we know that you are many, those who like strong emotions. We will leave from the marina of Ribadesella without a fixed course, and according to the weather conditions we will go east or west. We will reach vertigo speeds that will oscillate between 80km / h and 100km / h. Not suitable for children under 12 years. Departure time 16: 00 hours. Price: 35 € per person (minimum 6 passengers). Punctuation: 3.9. of 5 votes. 3 answers to "Nautilus: boat rides through Ribadesella"